Your private event made extraordinary. 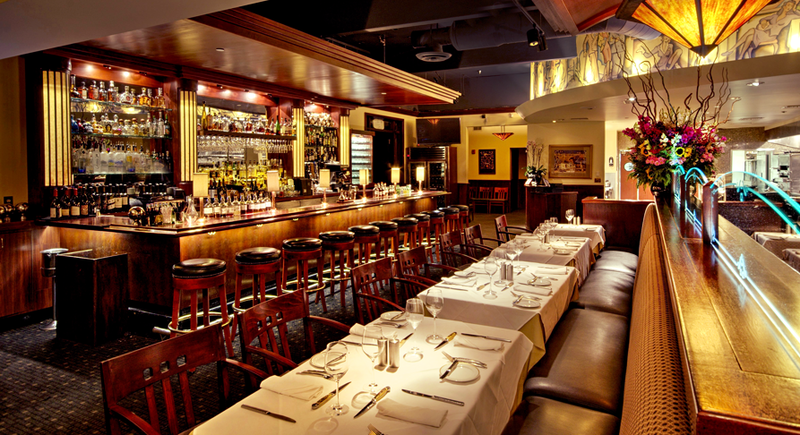 Arroyo Chop House is the perfect place for any celebration or event, be it a birthday, anniversary, holiday, rehearsal dinner, bridal shower, wrap party, awards show reception, charity reception, or corporate meeting. We are available for location filming for television, features, fashion and music. Our capable staff is happy to help coordinate your event to ensure it is both effortless and successful. The Arroyo Room provides a spacious and handsome space with rich wood and sumptuous lighting. The floor plan allows you to easily seat even large parties in comfortable arrangements at rectangular or circular tables. The setting is private, but your guests will enjoy the ambiance of this space, just passing through a glass door from the main dining room and lively bar. The Prime Room offers a secluded environment right off the main entry. The elegant space has beautiful fine art on the walls, a warmly-lit fireplace, and views into our glass wine storage. The Prime Room also boasts an assortment of configuration possibilities, including some that accommodate the use of a wall-mounted plasma television for presentations or displays. The Arroyo Chop House covered patio makes for a lovely al fresco private dining experience. The space opens up the the main dining room and the attached Arroyo Room. The patio and Arroyo Room may be combined to accommodate 80 people. Multiple table arrangement options are available. Heaters and an outdoor fireplace make the patio a comfortable and inviting space year-round. Arroyo Chop House offers three dinner packages each with at least three courses. The menus allow you to customize the selections for your event. Each prix fixes gives you the freedom to tailor a menu that gives your guests choices to suit their preferences including: seafood, steak, and chicken main course options. Our party planners will be happy to guide you through our menu packages to meet your individual needs. You and your guests can expect the same impressive food and attentive service that one experiences with every dinner at the Arroyo Chop House. The Smith Brother's restaurants are icons in the Pasadena dining community—made famous for their high-caliber food and personalized service. Smith Brothers Restaurants applies this same level of excellence and customized experience to their off-site catering.